We’d love your help. 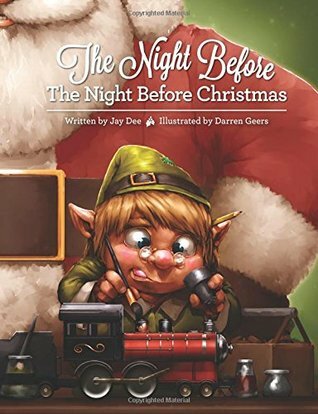 Let us know what’s wrong with this preview of The Night Before The Night Before Christmas by Jay Dee. To ask other readers questions about The Night Before The Night Before Christmas, please sign up. This children’s picture book is quite simply beautiful. The story is beautiful, written by Jay Dee in simple but elegant and evocative prose, and the illustrations by Darren Geers are beautiful, colourful without being garish and with a truly lovely light quality. The book has also been beautifully produced, nicely printed and well laid out. The illustrations create a large part of the book’s charm. The artist has imbued the drawings of Elfie, the other elves and Santa Clause with a great deal of This children’s picture book is quite simply beautiful. The story is beautiful, written by Jay Dee in simple but elegant and evocative prose, and the illustrations by Darren Geers are beautiful, colourful without being garish and with a truly lovely light quality. The book has also been beautifully produced, nicely printed and well laid out. The illustrations create a large part of the book’s charm. The artist has imbued the drawings of Elfie, the other elves and Santa Clause with a great deal of expression. They beam off the page. But the story itself does something wonderful; it merges the story of Santa Clause with the birth of Jesus, and also makes a clear statement on the kind of dedication required to achieve perfection. Santa Clause and his role as gift bringer to the good, and Christmas as the story of Jesus Christ’s birth can easily seem like two unrelated ideas of Christmas, but this story shows that it doesn’t have to be like that. I love this story so much that I will read it to my family on Christmas day—and my child is twenty one! The overall story of the book is very endearing. We have Elfie, one of Santa's elves, working really hard on a present. He is spending so much time on making the gift perfect that the head elf, Nathan, starts getting upset. But, Elfie won't give up, and when Santa comes to inspect his workshop, Elfie is still fussing over his toy train. Nathan is worried Santa will be mad, but it turns out Santa asked Elfie to work on this particular gift and make it perfect. All the elves wonder why this one present needs to be perfect, and Santa tells them that it is for a very special boy, the baby Jesus. I really think the illustrations are fabulous. The first time I looked at the cover I was taken in by the adorableness of Elfie painting the train. The rest of the illustrations followed suit. I loved the boldness of color, the different viewing perspectives and the awesomeness of the elves. Their big eyes just add that special something. The concept behind the whole story is precious and reminds me of The Little Drummer Boy. The thing that did bother me was the timeline. If this is the night before the night before Christ is born, then how did Santa already exist? And why would they be making baby Jesus a train when he was born at the time of donkeys for transportation? But, I do like how the author tried to connect the commercial thinking of Christmas to the spiritual side. It's nice to have a book that let's children connect Jesus with the modern day giving of gifts. 3.5 Stars! The night before the night before Christmas is an adorable heart-warming tale that I would recommend to everyone, young and old. It tells the story of Elfie, one of Santa’s elves who spends the whole day working on one toy, while his comrades rush to complete all the presents for the children of the world. It holds a sweet message, that sometimes speed and volume of productivity isn’t the best thing. That it’s okay to spend a lot of time on one thing if you make it perfect. This is something tha The night before the night before Christmas is an adorable heart-warming tale that I would recommend to everyone, young and old. It tells the story of Elfie, one of Santa’s elves who spends the whole day working on one toy, while his comrades rush to complete all the presents for the children of the world. It holds a sweet message, that sometimes speed and volume of productivity isn’t the best thing. That it’s okay to spend a lot of time on one thing if you make it perfect. This is something that people can forget in this modern age and it’s important to remember this and teach to children. The story ties together two Christmas traditions in a beautifully understated way. I think linking them like this is a great way of introducing them to children. The illustrations enhance and complement the story, making you fall in love with the characters immediately. Not to mention how incredibly skilled the artwork is. The entire production of the book is of a highly professional standard. It is a good, large size and comfortable to hold while lying in bed reading to your child, which is just what you want from this kind of children’s book. I recommend this book for the AIA Seal of Excellence. The Night Before The Night Before Christmas is a beautifully illustrated, timeless tale with a twist. It is the night before Christmas Eve and all of Santa’s elves are at work making the final toys for Santa to deliver to all the good girls and boys the very next night. Main character Elfie is a likable little fellow who takes pride in his work. And he wants the toys he makes to be perfect. His perfectionism is something many of us can relate to; I sure can. But unfortunately for Elfie, this is The Night Before The Night Before Christmas is a beautifully illustrated, timeless tale with a twist. It is the night before Christmas Eve and all of Santa’s elves are at work making the final toys for Santa to deliver to all the good girls and boys the very next night. Main character Elfie is a likable little fellow who takes pride in his work. And he wants the toys he makes to be perfect. His perfectionism is something many of us can relate to; I sure can. But unfortunately for Elfie, this is no time to be perfect. Or is it? My favorite part of the story, besides the spectacular full-page illustrations, is that Santa himself knows the reason for the season, or put another way, Santa knows the true meaning of Christmas and who and what it is that makes Christmas special. You have to be open to what I call a “time paradox” (the twist) at the end of the story, if you are, I’m confident that you and your children will embrace the feel-good message presented here. Overall, The Night Before The Night Before Christmas is a sweet story about a very special Christmas gift. Once I read the story, though, I was completely hooked!! It's sweet and simple, with a nod towards the true meaning of Christmas. I give The Night Before the Night Before Christmas four and a half stars. It's a ready-made classic your family will want to read and re-read for many Christmas It was the illustrations that sucked me into The Night Before the Night Before Christmas. I was sent a few samples before I ever read the story and they were so whimsical and colorful I decided I had to read it. I give The Night Before the Night Before Christmas four and a half stars. It's a ready-made classic your family will want to read and re-read for many Christmases to come. Each year we add a few titles to our holiday collection. I'm so excited to add The Night Before The Night Before Christmas this year! We do a modified version of Elf on the Shelf where our elf brings us books. We are planning on having our elf bring this book on his first night visiting our house. The illustrations are so warm and inviting. They do such a nice job of complimenting the text. Best of all is the message of always doing your best work! Loved the book and the illustrations. Found this book adorable and sympathize with the perfectionist Elf. I often get caught up in the "doing" and forget to finish the task in a timely manner. Loved seeing how this was exactly what Santa wanted. Loved how the author mixed traditional folklore with the Christian meaning of Christmas. Heartwarming story that all ages will love. Beautiful pictures! This really will be a new family tradition. Every December 23, The Night Before The Night Before Christmas will be read and enjoyed! Inspirational children's Christmas book about the power of persistence and striving for perfection. BEAUTIFUL pictures that will captivate any child and a sweet surprise about who Santa picks to get Elfie's train...the perfect present for the perfect Baby! LOVED the illustrations!!! This was a "buy it for the cover".